Rob Masters nicks the ball away during Swineshead's win at Wyberton. The Boston Saturday League season got underway with reigning Premier League Champions Swineshead Institute putting seven goals past Wyberton Reserves. Jack Houghton bagged himself five with Keiran Rose adding a brace. Ruskington Rovers secured their first three points of the season, winning 6-0 away to last year’s runners up Spilsby Town. Wesley Greenwood put away three goals, as well as Samuel Jackson, Chris Mountain and Ryan Norris also helping their team to victory. Pointons’ Nathan Wilson, Don Kew and Ben Dobson put were on target in a 3-1 success against Leverton. JFC Boston Seniors were looking to secure three points on their debut in Division One, but Woodhall Spa United snatched the three points with a 2-0 win. 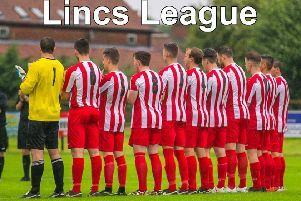 Skegness United kick started their first season in Division One with a 2-0 win against Old Doningtonians, goals coming from Domonic Lyons and Callum Barlow. A special mention should go to the Old Dons spectator who stepped in to referee the game. Elsewhere in Division One, Friskney took three points at home to Kirton Town and Swineshead Institute Reserves gained three points with an own goal settling the game. New to Division Two, Colsterworth Sports and Social Club made their mark on the league by putting seven goals past Holbeach Bank to take home three points. Also putting seven goals away were Boston International. Three games took place in Divison Three, with all home sides taking victory. Leverton put six past Mareham United, Northgate Olympic bagged five goals against Woodhall Spa Reserves and two goals from Joshua Wittam, one from Charlie Arabin and another from Victor Sibert helped new team Skegness A beat Benington Reserves 4-1.